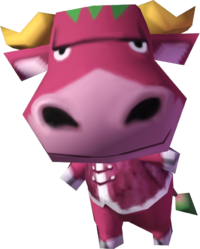 Oxford is a cranky bull villager from the Animal Crossing series, who only appears in Doubutsu no Mori up to Doubutsu no Mori e+. Oxford's name comes from an Ox, a species of cattle similar to bulls. "Oxford" is also the name of a famous city in the United Kingdom. His catchphrase refers to his species, the bull. Oxford is a pink bull with green hair and a protruding forehead with yellow horns. His nose and hooves are a lighter shade of pink, as well as the insides of his ears. His initial clothes are the Leather Jerkin, which, ironically, is made of cow skin. Oxford is a cranky villager, meaning he will appear rude and belittling to the other villagers, as well as the player, at first encounter. He will get along with lazy villagers, admiring their laid-back lifestyle, as well as get along with snooty villagers, his personality's female counterpart. However, he will be annoyed by peppy and jock villagers, and will criticize them in conversation, seeing the former as "too happy" compared to his bitter attitude. Oxford is one tough bull. This guy, wow. He can lift a piano with one hoof tied behind his back. He can push a car for miles. He even says he can pull a huge tree right out of the ground... Although he may just be pulling your leg. Modified on March 11, 2019, at 00:50.